If you’re like me when you evaluate new software, you’re looking for specific outcomes. You wonder: “How will this software take care of X? Can it help me with Y?”. Before you even try it, you want to know right away: “Is this software going to solve my problem?” Or, in other words, “If I use this software, will my problem go away?”. When we set out to develop modern financial and retirement planning software, we didn’t know what would make it good. So, we asked our customers. We asked over a thousand Canadian financial advisors, planners and investment managers what they found the most challenging when developing financial and retirement projections for their clients. Here’s what we learned. We found out that no matter what financial planning software advisors were using, the data entry process was both frustrating and time-consuming. They wanted to spend less time entering data and more time helping clients. Why should it take so long to develop projections? Existing software was either cumbersome, too complex and not user-friendly, or it was too simplistic and not flexible enough. Advisors said it felt like a black hole sucking up all their time. Some attempted to develop their own solutions (for example in Excel). While such solutions are more flexible, they are very error-prone. It’s easy to accidentally make a change in a spreadsheet, putting you at risk of dramatically impacting clients’ projections without even noticing. Catching such mistakes is hard. It’s also difficult to train new staff on these home-grown solutions and maintain them over time to make sure they adhere to the current tax law. Advisors should be able to instantly develop simple projections and have the flexibility to make more precise changes if warranted. For example, the year when a client leaves their job and retires is a year that needs to be modelled with higher precision than others. This is to properly reflect the amount of employment income, pension or other benefits received in that year to avoid misrepresenting or doubling up the amounts. We found transparent software design is critical to success. Advisors need to know that everything is accounted for and there are no mistakes. Financial planning is not rocket science, but there are a lot of moving parts, each impacting the other. For example, a simple change like delaying CPP impacts cash flow, which may mean a client will need to make additional withdrawals from other assets, which may impact their tax position, income splitting and even OAS clawback, and so on. To maintain transparency, it’s useful to see everything on one page and have the software assist and alert you if any issues arise. Advisors often complained of spending considerable time preparing and formatting client reports. However, the reports generated by most programs are designed for advisors, not consumers. They’re too complex for clients to understand, making them useless in client presentations. We found that simpler reports (or interactive presentations) are best suited to convey information to clients without overwhelming them. We asked consumers what they wanted to see in their financial plan and then designed a report template laid out exactly in the format they asked for. It turns out a visually appealing, easy-to-navigate report that you can easily update, enter comments into and use to instantly create a client report works much better than a long, complex 50-page report that is rarely read and almost never updated. Fundamentally, it’s not about the plans, but it is all about planning. This is also one of the reasons that we see so much success with interactive financial planning. Often an advisor prepares two or three different plans for a client. However, sometimes a client will request a few modifications to a selected plan. They may want to know: “If I take a year-long sabbatical when I’m 55, will I outlive my savings?” or “What lifestyle will I have if I sell my business in 10 years for $2.5 million?”. Creating what-if scenarios is immensely useful. Not only do they show the short-term impact of a client’s decisions, but they help the client understand the consequences of these decisions to their lifestyle in retirement. Often, these scenarios can also uncover previously unknown and undiscovered client goals. If you cannot efficiently run what-if scenarios with a client, you set yourself back in time spent in back-office preparing plans and on additional client meetings; client satisfaction also suffers. Clients love seeing what-if scenarios in real time; instead of feeling helpless and detached, they become fully engaged in the planning process. As a result, client meetings are easier to conduct, run more smoothly and are more enjoyable. Clients tend to be more satisfied with the planning process as they gain understanding and clarity about their financial matters. Thus, clients gain a lot more appreciation for the work you are doing for them, which positively impacts referrals. Did you notice the recurring theme? 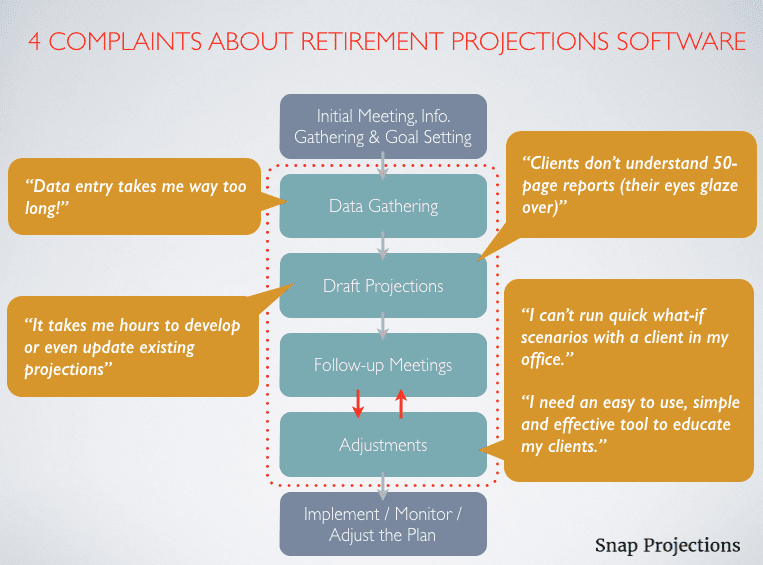 At Snap Projections, time spent is not something we get a lot of complaints about. That’s because we believe no matter the function of the software, it must bring you closer to your end goal. It must make your life easier as the whole point of using technology is leverage. Doing more with less. Do you agree? Do you want to spend less time and do more for your clients? Watch the Full Power of Snap Projections in 5 minutes to see how Snap Projections can help you better serve your clients while saving time. Here’s a link.